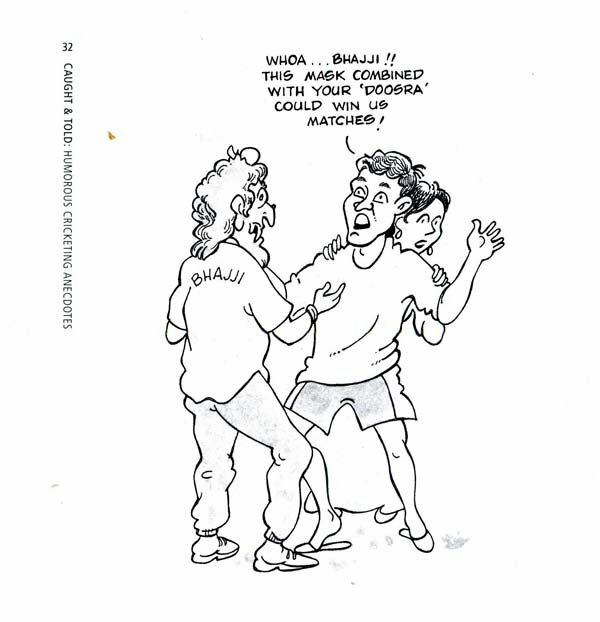 Caught & Told - Humorous Cricketing Anecdotes is a compilation of real-life cricket stories collected by Sandeep Patil, a famous prankster during his playing days, and Clayton Murzello, sports editor of Mid-Day, India’s largest selling tabloid. Anyone who loves his cricket will relish these locker-room and playing-field anecdotes involving the famous names of Indian cricket from across several generations. The anecdotes bring alive the players and the different eras they played in, and evoke the timeless charm and spirit of the game. 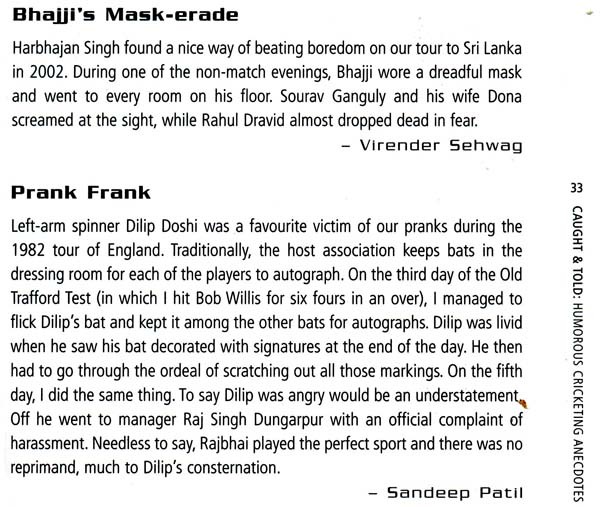 Sandeep Patil, born in 1956, was one of the most entertaining players on the international stage in the 1980s. In his five-year- long international career he came up with some sterling performances. In Australia in 1980-81 he took on the likes of Dennis Lillee, Len Pascoe and Rodney Hogg to plunder 174 at the Adelaide Oval. If that was his finest hour, he gave power hitting a good name when he scored 24 off Bob Willis in a single over at Old Trafford in 1982. When not wielding his willow, Patil had other interests and these included editing a Marathi magazine called Shatkar. He is a known prankster and is never short of a story, some of which have made it to this collection of anecdotes. Clayton Murzello once sold sports books at Marine Sports, the only specialist sports bookshop in India, before deciding to get closer to his favourite sport, cricket. He leapt into journalism in 1989 and today is Sports Editor of Mid-Day, India’s largest-selling tabloid. Murzello has covered cricket in five countries, and been to two World Cups. At the 2005 Sports Journalists Federation of India awards, Murzello won the prize for the best offbeat story. The great thing about cricket is that it produces so many characters and so many funny moments. One reason for this is the sheer length of the game. Our shorter version of the game is twice as long as any other sport. So, there is a lot of time for things to happen and develop. Some of the game’s great characters use their time productively playing practical jokes on their mates. The sort of creative mind that you need to be successful at cricket is very useful for practical jokes. Most of the players I played with, those who survived any length of time, did stay because they had a good sense of humour. They could laugh at themselves, at others and at serious moments as much as funny ones. You need characters in a cricket team. There are plenty of times when you could take yourself too seriously. To have someone like Doug Waiters in the dressing room or out on the field just to lighten those serious moments was a good way to be able to survive. I am sure one of the reasons why we (Australia) became a good side was because we had a lot of characters. You will find that most good teams have such characters. They are not all the same though. Some are funny because they are serious and their teammates take the mickey out of them because they are so serious. I have seen guys get over their seriousness and begin to see the lighter side of life. It helped them become better cricketers. Whilst cricket has become more of a game of statistics these days, it has really been more of a game of stories. There are probably more books written on cricket than on other sports and I am sure it is because of the duration of the game, which allows many funny moments. In days gone by, after the day’s play, we talked cricket and told stories. I think the folklore of the game has survived and the game is richer because of its characters and stories. I am sure readers of the book will enjoy the stories in these pages.